In this edition of our newsletter, we will cover the new content and features that have been added to Genealogy Quebec over the past month. The Great Collections have been separated in 3 distinct sections in order to make them more accessible and user friendly. Please note that we are currently unable to take your calls. Please leave a message and we will call you back within 24 hours. For the first two options, the payment method is selected during the checkout process. Credit card subscriptions are now activated automatically and instantly. Our FAQ (Frequently Asked Questions) page has been reworked to make it more relevant and simple to use. We will be adding to it as we receive inquiries from our users. We have separated the 15 tools offered on GenealogyQuebec.com in 3 categories, in an attempt to make the website more beginner friendly. These are the most comprehensive and detailed tools available on the website. For most of our subscribers, these 3 tools will be sufficient to find their ancestors and retrace their lineage. All of these tools are equipped with a search engine. These are our complimentary research tools. They are used to address potential gaps in searches made using our primary research tools, or to add additional sources and content to these searches. All of these tools are equipped with a search engine. You may also notice that we have added documentation to the Search tools page. You can access it by clicking on More information next to the tool’s description. This documentation contains information about the type of documents, the region and the period covered by the tool, as well as a short tutorial. In our previous newsletter, we announced the acquisition of Planète Généalogie by the Drouin Institute, and the gradual addition of numerous collections to Genealogy Quebec resulting from this acquisition. Can be browsed in the Drouin Institute’s miscellaneous collections tool, under 16 – Archives municipales. Documents from the counties of Berthier, Joliette and Arthabaska. Directories and indexes of mayors and municipalities. 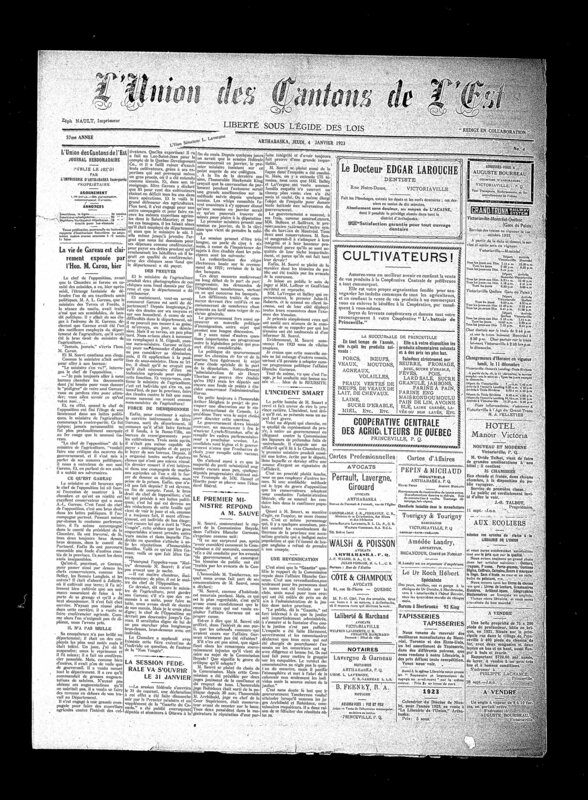 Can be browsed in the Drouin Institute’s miscellaneous collections tool, under 23 – Journaux anciens. Can be browsed in the Kardex tool, under 01_Fiches BMS. These are files containing information (names, dates, locations) pertaining to various individuals who lived on the south shore of the St-Lawrence river. With these additions, we have officially reached over 44 million images and files on GenealogyQuebec.com! This is another important milestone in our efforts to preserve and share the genealogical heritage of Quebec and New France, which wouldn’t be possible without our subscribers. Thank you! In addition, the corrections sent by our users over the past 2 months have been applied. You will find a list of the the parishes that have been updated at this address. 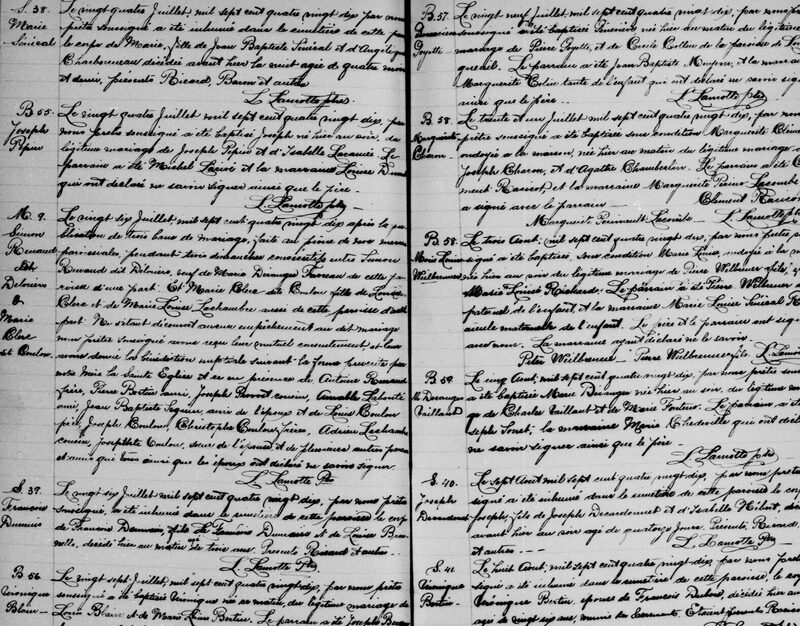 The LAFRANCE, one of 15 tools available to GenealogyQuebec.com subscribers, is a detailed index with link to the original document of ALL Catholic marriages celebrated in Quebec between 1621 and 1916, ALL Catholic baptisms and burials celebrated in Quebec between 1621 and 1849 as well as ALL Protestant marriages celebrated in Quebec between 1760 and 1849. Baptisms and burials of the 1850-1861 period are added gradually through our bimonthly updates. This section contains Canadian obituaries ranging from 1999 to this day. You can browse the collection free of charge here. To conclude, the Drouin Institute team would like to wish you a happy holiday season as well as a new year filled with genealogical discoveries!